At eight in the morning our interpreters Ritah and Tinah, five of our team and the driver Abu set off on the dusty red dirt roads towards Bulondo village. For me (Tessa) it was the first time going to the field. 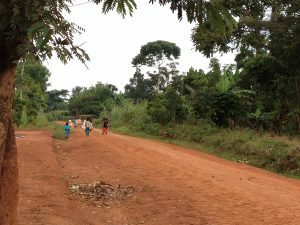 I was impressed with all the sugarcane and banana groves, the countless piles of red bricks that were burned on the roadside, the lush green vegetation and the many, many children that jumped and laughed when the car honked at them. After all, almost 50% of Uganda’s population is younger than 15 years old, and we could see that. Some drizzly rain started falling and soon the road changed texture. Discouragingly, the back wheels of the white van in front of us swayed left and right and left again as the van fought its way uphill. Our driver somehow managed to slide slightly less and we breathed in deeply as we finally got out of the car. In Bulondo we were met by Irene and Wiliber, the local CHWs. In two teams we interviewed both about their work. We also surveyed eight recent mothers that lived in the area and were part of the Maama project. Conducting all interviews in the same systematic way was (of course!) not as easy as I had thought. I feel like I learned a lot from speaking with them. Some mothers had already borne eight children and shared many insights about their life with us. One thing that impressed me was that when we asked a somewhat strange or unusual question (e.g. about feeling sad after birth, we wanted to explore if postpartum depression plays a role in this area), the women always stayed friendly and humorous in their answer. Rather than frowning or shrugging their shoulders, they laughed and explained how they felt. One woman gave us a bag of fresh cassava roots; at another house Wiliber suddenly surprised us with a jackfruit. I correct: a huuuge jackfruit! Whoever hasn’t yet met these exceptional creations growing on a certain type of tropical tree might want to google how they look like. Weighing perhaps 10 kg and featuring many shades of green on its spiky surface, the jackfruit contained rather large seeds. Each seed was wrapped in a fleshy, light yellow, edible envelope, which tasted somewhat like saffron ice cream. Mild, sweet and unfamiliar. Not my favourite fruit in the universe, but a good refreshment. Having completed the day’s work, we got back into the car and Abu started the engine. What followed was the so far most adventurous hour of this entire trip. After passing Mayuge, more and more rain poured down and we realised that the condition of the streets a few hours ago had not been a problem at all. Not compared to the state that the road was in now! The combination of large puddles with the entirely softened soil created a slippery, unreliable sliding surface for our poor wheels. The sensation was less that of riding a car bur rather that of floating on waves, smoothly up and down and mostly forwards. In fact, it was a lot of fun and Abu clearly had a great time. His laughter was contagious, as he yet again manoeuvred us across a particularly large puddle and pulled the car onto a marginally more solid patch of road. One time we did get stuck though. The wheels spun freely and sprayed a million droplets of muddy brown-red water onto our windows. A group of locals appeared out of nowhere and heroically pushed us out of the puddle. Phew. This exciting day ended with a cold beer – Nile Special – and watching the football match in faraway Paris. After all these adventures I have high expectations for the next field day!